Before anyone gets the wrong impression, I don’t claim to be a professional writer. I do, however, love writing in all its forms and have pursued it throughout my life. In college, I even worked as a writing tutor and took extra classes in literature and creative writing, outside my major. Today, I’m often called upon to write for professional purposes, such as an explanation of a process or the narrative of a client presentation. In those cases where the starting point is framed, and clarity, concision, and directness are critical, I think my work passes muster. When I write for myself, to vent what’s on my mind and explore ideas, it is often very short, rough around the edges, and perhaps half-baked. In every situation, I have come across more or less the same patterns and sticking points in the writing process but have never found a good way to articulate them until now. The front cookie is early-stage concept development (for the purposes of this illustration, let’s say this is the side you remove on which the icing does not stick, and it happens to be facing you). It’s all about that hint of a great idea that sets off a researching binge, furious note-taking, and camp-outs at the library. What a thrill it is to uncover some forgotten piece of history or identify a gaping blind spot in popular discourse! However, many people often don’t have a clue where to begin or can’t turn the spark of an idea into a flame once they have; they would love to skip right to the middle. Common symptoms of this problem include writer’s block, the constant need for an inspiration fix, and the waste basket overflowing with crumpled balls of paper. The back cookie is editing, proofreading, revision, and all other manner of fine-tuning — the front cookie’s evil twin and the icing’s nemesis. This is the realm of MLA, APA, Chicago, Strunk & White, Merriam-Webster, Roget: rules, rules, rules. Perfecting language is an art unto itself, and many relish the power of the red pen like a conductor wielding a baton (in a way, proofreaders’ marks kind of look like musical notation on a heavily reviewed piece of writing). Were it not for this critical phase of the process, brilliance would quickly tarnish with every typo, run-on, and misplaced modifier. But there are those who dread the tedium of deleting extra spaces after periods, inserting missing commas, and “cutting out the fluff.” It’s so much more fun to brainstorm ideas and then hole up in a writing studio for a week. Where’s that bag of cookies? I happen to savor the front and back cookies. I can summon ideas at will, follow a paper trail like nobody’s business, and start to get some solid ideas down… until another idea strikes my fancy. I can also prune and weed the nastiest of prose with delight. Meanwhile, that delectable icing just sits there, longing to be licked. Why is that? Following through with an idea and carrying it to completion takes motivation and concentration, not to mention sufficient time and a suitable environment to think and write productively. There’s no magic combination of these ingredients that lets good writing happen — we all take what we can get, whether it’s on a train, in a waiting room, or between meetings. If you’re lucky enough to have a few candles lit and a bottle of Merlot, more power to you. For me, what stands in the way of finding flow is the paradoxical need for perfection and an immediate payoff. Of course, the rational mind recognizes that good anything is about neither of these things, yet the irrational mind constructs its own asylum and appoints its own cruel wardens. In my case, I have plenty of ideas I think are great, but through procrastination, distraction, and other means, I have abandoned them in the parking lot. Futurism & Transhumanism: What frameworks are we using or not using to make sense of the complexities of future-focused thinking, especially regarding transhumanism? How much of what we think about the future is shaped by popular science fiction? The Content Lifecycle: What are the different dimensions of conceiving, creating, sharing, storing, searching for, and consuming content today? What would a picture of it all look like (key players, outlets, channels, etc.)? Work & Companies: What is the gap between what companies and employees offer and expect from each other? How has it changed over the years? Does the traditional work paradigm truly enable people to realize their fullest potential? Neuroscience & Information Design: What do we know so far about perception and cognition as it relates to the work information designers do? How much science can be infused in the practice of information design? Visual Thinking & Technology: How is technology reshaping traditional visual thinking practices? Are new devices, apps, and platforms really enabling collaboration and understanding or just getting in the way? For these ideas to be realized, my approach needs to change. Some of these ideas will require a bit of effort to develop, while others will be treated as thinking in progress, or unpacked in a series of posts. The key here is that not all writing need be treated the same way. That’s the beauty of writing: there’s a form or style to suit virtually all purposes and preferences. From tweets to multi-volume sagas, written expression spans a broad spectrum (whether or not all of it qualifies as serious writing is another issue entirely, considering the shifting boundaries of what being “published” and what “quality” constitute these days). I happen to be fond of Twitter as a micro-blogging platform because I can regularly broadcast my thoughts and interests without all the stress of fussing over a longer piece of writing. 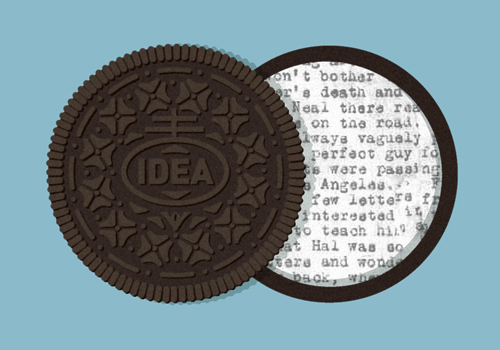 Tweets are perfect in their brevity and immediacy, and they’re instantly gratifying — just like Mini Oreos. Blog posts allow for more fleshed out thinking while leaving some room to test the waters with an idea or spread it out over time. The form of the blog encourages dialogue and helps evolve thinking, unlike long form or more journalistic writing that, to me, feels very monolithic and inert. Ultimately, all the forms of writing I undertake will have to meet a minimum standard of “good enough” so that I can maintain a steady output. Creative paralysis will set in otherwise. The moral of my story: While there’s a clear front, middle, and back to an Oreo, you can eat it many different ways. Sometimes it’s about twisting it apart, taking small bites of the whole, gobbling it all at once, or having an entirely different variety of Oreo altogether. No matter what, be sure to dunk it! But I do like that you tagged this “absurd.” There are many ways in which I can interpret that. I also like your description of “pure writing flow … but once there, everything just happens. Thoughts spill out faster than the hand can capture them. Adrenaline starts pumping. Time stands still.” Sounds like bliss. I’m not sure I’ve reached this while writing, but I might add that it could also describe (certainly more often for me) pure reading flow. For me, the best reading experiences are transportational, where enough factors join together to trick my mind into thinking its been moved some place else. Time does slow down. Sound changes. Smell is engaged. And if it’s really transportational, the illusion doesn’t end there. It’s captured in your memory, as well. As I reflect upon this idea, I realize that I have plenty of false memories, embedded in my mind by transportational reading experiences, of walks through London I have never taken, the bustle of offices in which I’ve never worked, of tours of the interior landscape of the minds of others. I could go on. The occasional transportational reading experience keeps me reading, in the hope that it might happen again. And of course, I aspire to create that kind of experience for someone else in my own writing, but I honestly doubt I’ve succeeded yet. Thanks, Chris. I’m curious to hear those different interpretations of “absurd” in relation to my post. Perhaps I over-dramatized the description of flow, but how else could I make my Oreo icing appealing? I’ve actually had moments where a switch was flipped and every obstacle to generating content was cleared. That’s not to say that what came out of it was sheer genius. Much of it made me cringe. But you’re right in that most focused and deliberate writing comes without the euphoric stream of consciousness — you simply sit down and get to work.